After taking on an apprentice from New College Durham back in 2015, MGF invited students from the college for an open day in January of 2018. The four students, who all studied Fabrication and Welding Level 2 or Level 3, were hosted by the yard foreman Ger Hallahan and other staff members at MGF’s Durham depot. The day began with an overview of MGF before changing into PPE and being introduced to the workshop. Experienced welder, Richard Hall, had prepared welding equipment and demonstrated real damage repairs, with an emphasis on how safety critical the work they carry out is. They then headed back to the office for a casual question and answer session. 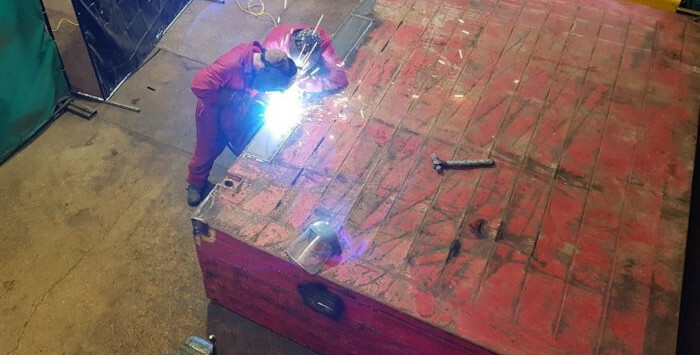 “I always knew I wanted to be a welder but my day with Richard solidified this and I’m excited to stay here for a career after my apprenticeship”. We’re looking forward to and wish Kevin every success in his career with MGF!